Best restaurants in dublin My trip started with a meal at an authentic Irish restaurant, Metro Cafe, recommended to me by the receptionist at the Radisson Blu Royal in Dublin. I went with their popular bangers and mash (sausage and potatoes with gravy). It was exactly what you’d expect. Lacking any type of complex flavors and textures. It was salt, gravy, meat and potatoes. That best describes the experience. After my first meal in Ireland, expectations became low. The next day I went to the Guinness Storehouse to tour the facility. People were saying the food was pretty good there so I decided to stay hungry so I could eat there. I ordered the roast beef with mashed potatoes and vegetables. It sounded like another traditional Irish dish, and it was. Unfortunately, it was dry and salty. As I ate the meal I just felt sad. Like all the sadness and strife of the Irish people were embodied in this meal. I immediately became happy after drinking a Guinness. It was smooth and hearty. As I ate the meal with the beer, it felt like Irish innovation went towards improving beer instead of food. In that moment, it was the best beer I’ve ever had. Struggling to find a good meal in Dublin, I started looking through episodes of the numerous travel shows by Anthony Bourdain. He had an episode on Dublin in his “The Layover” series. Alright! New mission acquired. I love a good chicken sandwich and sincerely believe the best chicken sandwich is at Howlin’ Rays in Los Angeles. With the bar set really high, I went to Crackbird in Dublin to see what they had to offer. Best restaurants in dublin. Around 1:30pm I walked into Crackbird and it was pretty empty. No staff was in the front to acknowledge the customer and provide a menu. I saw a menu on a table and started looking through it. There were a few customers in the back (I could hear them, but didn’t see them) but for the most part this place was empty…probably for a good reason. I ordered the fried chicken thigh sandwich combo. It included tomato soup. I also threw in a side of the “Best Prawn crackers,” long story short, they were not the best. best restaurants in dublin. The tomato soup and “average” prawn crackers came out first. The soup was thick and salty. I took a scoop and there was this yellow cube in it. It looked like cheese to I bit right into it and realized it was butter. Damn. That should have been diluted into the soup. The prawn crackers were plentiful and very average. The chicken sandwich came out and it was big and looked tasty. Unfortunately, that was the best part…hoping that it would be really good. The chicken was crispy at first but became very soggy within minutes because of all the sauce around it. The sandwich began falling apart and I had very messy hands now. The chicken did not have any seasoning on it which made each bite bland and a chore to finish. My biggest disappointment was that it was recommended by Anthony Bourdain. I’m guessing he was friends with the chef and he was being nice. My other guess is that maybe this IS the best chicken sandwich in Dublin because of a lack of competition. Time to kick it up a notch! Another recommendation by Anthony Bourdain and it’s really hard to make steak badly. As I got to the Chophouse, it was packed! That’s a good sign. It took a moment to find an available person to ask for a table. They asked if I had reservations, I did not. I guess you could say, I had “No Reservations.” You’ll get that one, let it sink in. 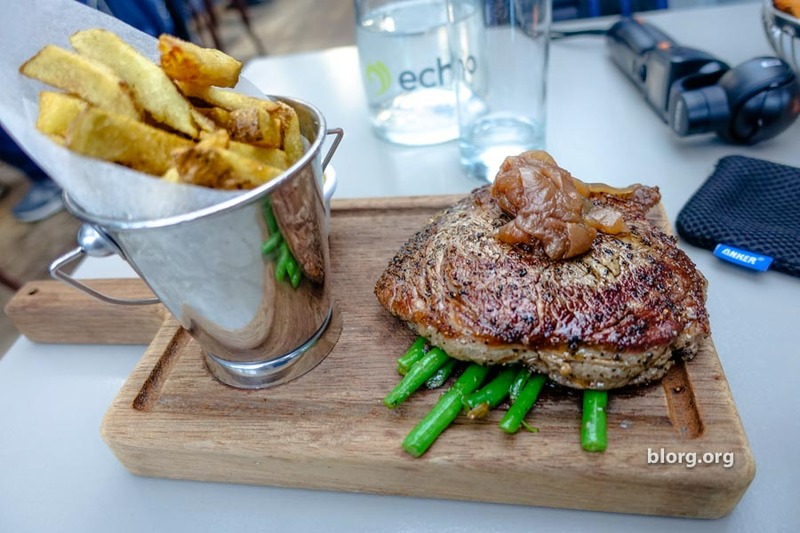 best restaurants in dublin | The server said to ask the bartender for a seat so I did. Once again, this place was packed. The bartender had me wait for a moment and said they were preparing a table. Cool! I’m in! I sat down took a look at the specials and the menu. It was pretty hard to decide with the limited selection but I ended up getting the “35 Day Irish Dry-Aged Prime Limousin 10oz Ribeye,” medium-rare. Sound amazing, right? Free bread was provided but I only had a small bite to try it. My experiences have taught me that the portion sizes are very big so I shouldn’t waste my time with bread unless I’m taking some food to go. The Ribeye arrived and it was BLOODY! It was very rare but I ate it anyway. The seasoning on it was pretty light. That 35-day dry aging process didn’t really make it taste better. I was disappointed because I had very high hopes for this place. It was a 40-minute walk from my hostel too! Damn it Anthony Bourdain, I respect you for showing food and cultures all over the world, but our tastes don’t align. I think you were too nice with your reviews because you were friends with the chefs.